Motorola One Power Full Specifications Leaked; Launch Seems Imminent - Playfuldroid! 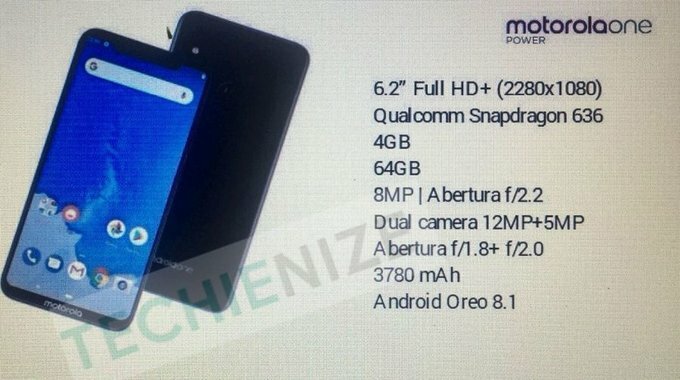 Motorola One Power is an upcoming Android One smartphone from Motorola. It is speculated that the company would be launching the One Power instead of the Moto X5 that was supposed to arrive as the successor for Moto X4 phone from last year. The entire specs of the smartphone have surfaced through a latest leak. Fresh information reveals that the One Power phone will be arriving with a 6.2-inch display. The renders of the phone that have released so far reveal that it will be housing a wide notch like the iPhone X. The display of the phone will be producing FHD+ resolution of 2280 x 1080 pixels along with an aspect ratio of 19:9. The Snapdragon 636 chipset will be fueled by the phone. It will be accompanied by 4 GB of RAM. The handset will offer an internal storage of 64 GB to its users. It will be arriving with a frontal shooter of 8-megapixel that will have an aperture of f/2.2. The rear side of the phone will be equipped with 12-megapixel (f/1.8 aperture) + 5-megapixel (f/2.0 aperture) dual camera setup. The handset will be receiving power from 3,780mAh battery. It will be preloaded with stock edition of Android 8.1 Oreo. Motorola may include some of its apps on the phone. As of this writing, there is no information available on its pricing and availability.